If you have a disability or injury, and your mobility is limited, then forearm crutches may just be a very helpful piece of equipment to own and use. A forearm crutch for one or both of your arms can be used to support your legs and lower body weight if your legs or feet are too weak or have too much pain to fully plant your weight down. In a home environment, where doorways can often be quite narrow, mobility wheelchairs can pose a problem with physical maneuvering. Traditional underarm crutches that go under your shoulders, or using a handicap walker, often do not feel right for some disabled or injured individuals. That is when these special forearm crutches can be used most effectively. One of the benefits is that you will able to be more mobile than if you used nothing at all. You also will not develop any discomfort under your arms like you would with traditional, padded underarm crutches. The forearm variety wraps around your lower arms. They are not only be used for excellent support, but they can help many individuals with balance issues as well. These forearm crutches can come made of aluminum or other metals. They are very sturdy and quite safe once you get used to using them. It is easy to navigate between rooms, even smaller rooms like bathrooms or closets and pantries. You can quickly learn to guide yourself with substantial control as you ambulate through your house. The best way to walk on them is to try to plant them down on the ground first before taking each step with your foot. 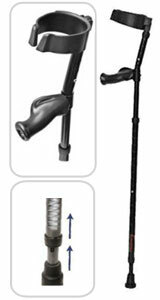 A quality pair set of crutches can cost under $70 in most health equipment stores or pharmacies. 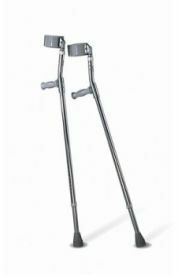 If you have sprained or strained your ankle, forearm crutches would be very useful. Also, if you pulled your Achilles tendon, you would find using them to be quite strong to help you sustain your mobility. These crutches don’t require much maintenance at all, just a regular cleaning and a drying to remove any sweat that might have dripped down. By using them you will strengthen your arms and upper body as well.